The least populated of all the towns on Cape Cod in Massachusetts, Truro is nestled close to the tip of the outer (lower) Cape, just below Provincetown and above Wellfleet. Incorporated in 1709, this little town has long been a tourist destination, but retains much of its quaint New England charm because nearly two thirds of Truro is part of the Cape Cod National Seashore. With the Atlantic Ocean on one side and Cape Cod Bay on the other, Truro is home to ten beaches, an historic lighthouse (still in operation and open to the public), as well as numerous hiking trails, bike paths, salt meadows, and cranberry bogs. Truro is also home to the Truro Center for the Arts at Castle Hill (exhibitions and summer workshops), the Payomet Performing Arts Center (theater, films, music), and Truro Vineyards of Cape Cod (tours and wine tasting opportunities available). The town center itself is classic small town, with no major commercial area save for a few restaurants and places to stay (there are, however, plenty of accommodations scattered throughout the town). 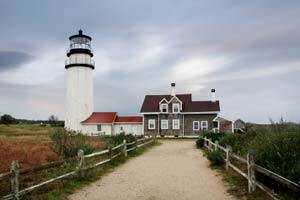 Perhaps the main attraction of Truro is that it is located near the Cape Cod National Seashore. If you are looking for a relaxing getaway to enjoy the natural beauty of the Outer Cape’s pristine beaches and woodlands, then Truro may be the place for you.